** Our next “Self Care by the Sea” retreat in April is now open for registration. You can read all about it, here. This week I’m sharing a journal entry I’ve posted before from my most recent book, Waking Up in Winter: In Search of What Really Matters at Midlife, which will be available in paperback on January 29th. This is my seventh book, and it’s a different kind of self-shelp book, a memoir in journal form, that offers you an inside look at what it means to live a life dedicated to growth and healing. I woke this morning to a cool breeze drifting through the bedroom window. It’s starting, I thought to myself. Winter will be here before you know it. Seems like only yesterday I was mixing compost and soil in pots on the deck, poring over flowers at the local greenhouse, and balancing on the ladder in the basement to turn the water back on for the outdoor faucet. Life hurtles by, days turning into weeks turning into months, and now the seasons I love most – the blossoming of spring, lazy summer days, and the fiery beauty of autumn – are coming to an end. Looking out the window at my withering garden I long for time to slow down, but I know better. It’s not about time; it’s about me. I need to plant my feet in the present moment. Time rushes by when I’m not where I am. These are the little things I dream about doing during long car rides to the airport, or when staring out the window of an airplane, traveling to yet another city to speak. I’m growing tired of hearing myself say I’m looking forward to (fill in the blank), followed by a bittersweet sadness rising in my chest. I need to stop looking ahead and start asking, What am I doing now that keeps me looking forward to something else? And why am I doing it? I’m preoccupied with how I spend my time these days, and I can trace the source of this feeling to my fiftieth birthday nearly four years ago. That morning I went downstairs, got on the treadmill, and began to watch a movie on TV. At the first commercial break, I realized I had no idea what the story was about as the significance of this birthday hit me full on. Fifty years old. Midlife. More years behind me than lay ahead. I’d heard all the clichés before, but they always applied to someone else – parents, aunts and uncles, older friends. Now they belong to me. Rather than avoid the subject of dying, I made a decision to dive into it. I shut the TV off and started thinking: What will life be like when I’m in my eighties or nineties, if I live that long? Will I enjoy good health or spend my days slumped over in a nursing-home chair? Who will handle my things when I die – my journals and the cards and letters I’ve stashed away in the old cedar trunk in the garage? Will I outlive Michael, my family members, and my friends? How old will I be when I finally leave the planet? Live peacefully in my body. Make beauty and nature more of a priority in my everyday life. Be less defended and more open to others. Let go of my self-consciousness and be bolder with my choices. These regrets may not be typical bucket-list items, but they reflect what’s always been deeply important to me: the inner adventure. I’m passionate about self-development and challenging myself to grow as a person, seeking out experiences that contribute to the evolution of my soul. Before I pushed the reality of mortality back into the shadowy corners of my consciousness, I had to admit that frightening as it was to think about my expiration date, it was strangely comforting as well. Death isn’t wishy-washy. It doesn’t fool around. When I’m done, I’m done (with this life, anyway), so I’d better make damn sure I’m doing what I really want to do right now. Soon I’ll be sharing info about book talks and a workshop celebrating midlife. In the meantime, if you’d like to hear more about the book (and midlife journeys), you can watch a video about Waking Up in Winter, here. P.S. – I’ll be on Facebook Live this Wednesday (1/23) at 6pm EST/3pm PST. 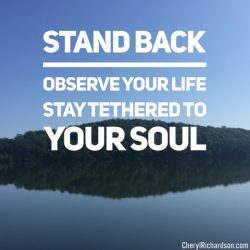 If you miss it, you can watch past sessions on my YouTube channel at CherylRichardsonTV here.